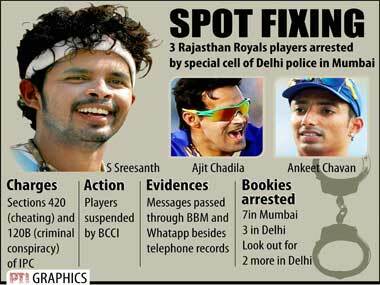 The 2013 Indian Premier League spot fixing and betting case arose when the Delhi Police arrested three cricketers, Sreesanth, Ajit Chandila and Ankeet Chavan, on the charges of spot-fixing. The three represented the Rajasthan Royals in the 2013 Indian Premier League. In a separate case, Mumbai Police arrested Vindu Dara Singh and Gurunath Meiyappan for alleged betting and having links with bookies. Spot-fixing involves a player agreeing to perform to order by pre-arrangement. For example, a bowler might deliberately bowl consecutive wides in his second over or a batsman could make sure he does not reach double figures. Twenty20 cricket is particularly susceptible because so much happens so quickly that individual performances can soon be forgotten or dismissed as inconsequential. 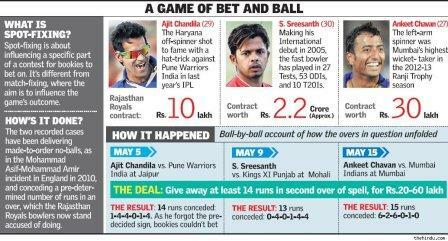 Betting on cricket matches televised in the Indian sub-continent is a hugely lucrative business. Fortunes can be made if a gambler knows in advance what a particular bowler or batsman is going to do. Bets can be placed on every delivery. Only betting on horse racing at trackside is allowed in India but in practice around half of a market worth billions of dollars is estimated to be illegal betting, mostly on cricket. International Cricket Council withdrew umpire Asad Rauf from the Champions Trophy in the wake of reports that the Mumbai Police are conducting an investigation into Asad Rauf’s activities in IPL spot fixing scandal. Sunil Bhatia, a bookie arrested by Delhi Police said that he was involved in fixing in Indian Cricket League and Bangladesh Premier League besides the IPL leading to speculations that the entire fixing scandal runs even deeper. A team of Delhi Police Special Cell officers arrested Yahya Mohammad in the early hours of 24 May 2013 from the Rajiv Gandhi International Airport (RGIA) in connection with the cricket betting. Ahmedabad Crime Branch arrested bookie Vinod Mulchandani from the Satellite Area of the Gujarat city on 25 May 2013. Rs 1.28 crore in cash, laptops and mobile phones were seized from his possession. Vindu Dara Singh was arrested for alleged links to bookies in this spot fixing. He was later released on bail on 3 June 2013 by a Mumbai court. Call records of Vindu Dara Singh in connection with the spot fixing scandal showed that he was in frequent contact with Chennai Super Kings (CSK) Team Principal and BCCI president N. Sreenivasan’s son in law Gurunath Meiyappan. To investigate whether frequent calls to Mr. Meiyappan were for betting, Mumbai Police had issued summons to him On 24 May 2013, Gurunath Meiyappan was arrested on charges of betting, conspiracy and cheating after he was questioned by the Mumbai Crime Branch. After his arrest, the CSK franchisee immediately disowned him. In a press statement on 24 May 2013, India Cements, which owns the CSK franchisee — said “Mr. Meiyappan is neither the owner, nor the CEO/Team Principal of the Chennai Super Kings. [He] is only one of the members (Honorary) of the management team of the Chennai Super Kings.” The main reason for the immediate disowning of him was that, his arrest could lead to termination of the CSK franchise. This was because of the Clause 11.3 (c) of the Franchise Agreement, which stated that “a franchise may be terminated immediately if the Franchisee, any Franchisee Group Company and /or any Owner acts in any way which has a material adverse effect upon the reputation or standing of the League, BCCI-IPL, BCCI, the Franchisee, the Team (or any other team in the League) and/or the game of cricket.” On 26 May, BCCI announced that a three member commission will investigate the role of Mr. Meiyappan in the spot-fixing and betting scandal. On 31 May 2013, a senior Mumbai Police official said that Mr. Meiyappanan had been warned by an official from the International Cricket Council’s ACSU.\ Mr. Meiyappan was later released on bail by a Mumbai court on 3 June 2013. Players, their faces masked, being led away for questioning. The police pulling an all-nighter to question suspects. Scores of indignant voices on social media demanding CBI investigations and arrests. For any issue to provoke this level of moral outrage in India, it seems it must revolve around cricket. Can you remember a single financial sector scam, whether it was the Rajat Gupta insider trading case, the exposé of Sahara group’s illegal Rs 17,000 crore mop-up or the Saradha scam, attracting similar public ire? Yet, if you look into the facts of the case, financial crimes have far more serious consequences than the IPL betting/fixing racket. In market manipulation or ponzi schemes, small savers have lost their limited nest-egg, which they never chose to risk, to schemes floated by unscrupulous promoters. These episodes have left some destitute, destroyed many livelihoods and weakened faith in the Indian financial system. In contrast, who are the victims of the IPL scandal? Possibly cricket-viewers, who after rooting for one team or another, feel a little cheated now. The players who didn’t succumb to bribery, and instead delivered their best to this format, may also have reason for complaint. But neither can claim that betting or match-fixing has destroyed their lives or left them poorer. And beyond these two categories of ‘victims’, it is hard to find any legitimate ones. Sponsors and event partners, who pour crores of advertising rupees into a sporting event do so only for general visibility. Advertising in IPL hardly comes with a guarantee that it will sell a certain number of bottles of soft drinks. As to the team sponsors, if at all they have any reason to complain, it is only about getting slightly less mileage for their brands than they hoped for. Yes, if you are idealistic, you can say that such scandals taint the game of cricket. But then, to purists, IPL was not the gentleman’s game anyway. With its abbreviated format, dancing and revelry and bombastic rather than stylistic batting, IPL was always about entertainment first and sport later.